Keeping it naturally fashionable. That is Nadia Jabour’s ethos and is a theme which runs throughout the stunning collection of jewellery made from environmentally-sourced materials commercially known as Designs by Nadia. 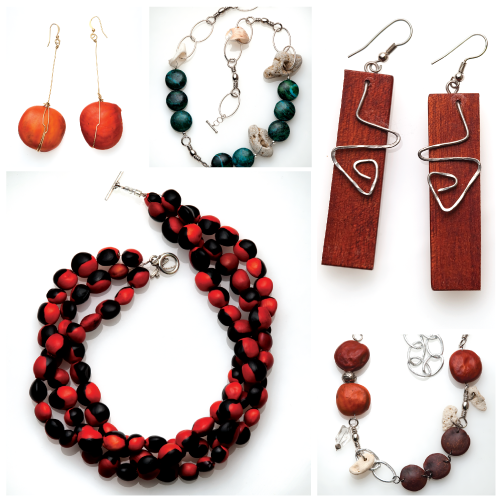 Jabour’s earrings, necklaces and bracelets fully embrace the adage that one thing may have many lives as she rejuvenates coconut shells, wood, seeds, stones, scrap metals, sea glass and sea stones. Each pieces is one of a kind, truly embodying the intention to “create with a difference”. Originally from Guyana, Jabour tirelessly tours the Caribbean to satisfy the demands of clients and retail outlets, the most recent of which is a flagship store in Rodney Bay, Saint Lucia. Sourcing raw materials from Guyana and across the region she believes that there is an “unlimited amount of natural resources that need to be used in a variety of ways and marketed to the world”. Her vision, extend beyond the region’s boundaries aiming to take her unique and affordable brand of beauty on to the world market using a fusion of indigenous materials and precious metals. Designs by Nadia has gained regional recognition and featured in the Caribbean high-profile publication SHE magazine. The brand was also chosen to take part in Caribbean Export’s Design Caribbean 2011 in the Dominican Republic gaining new market exposure.